Information: Fitting Restrictions Please note that for vehicles built after 01/2007 with the onboard power supply unit 6Q2 937 049 it is not possible to fit the cruise control kit due to technical problems. Please check the chassis number with ETKA to see if the build of the vehicle includes this power supply unit. 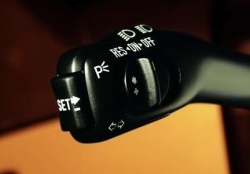 Product Details: Kit contains replacement wiper lever which includes the switchgear necessary for Cruise Control. The ŠKODA Cruise Control kit will enable you to keep your speed constant over 30 km/h offering all of the functionality of the production option.